Worcester Warriors full-back Chris Pennell was diagnosed with Type 1 diabetes when he was 19 years old - but that hasn't stopped him from a successful career in the sport that he loves. 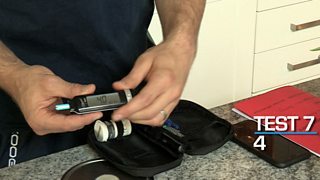 In this exclusive insight into his world, Chris shows BBC Get Inspired's Katie Bailey how he deals with his diabetes throughout a normal day at the club and at home. Please note that while Chris' regime supports his needs as a rugby player it won't be appropriate for everyone with diabetes. If you're in doubt please contact Diabetes UK. Feeling inspired? Why not find out how to get into rugby union.